An interesting claim about the ancientness of Samhain is made on the Knowth website. 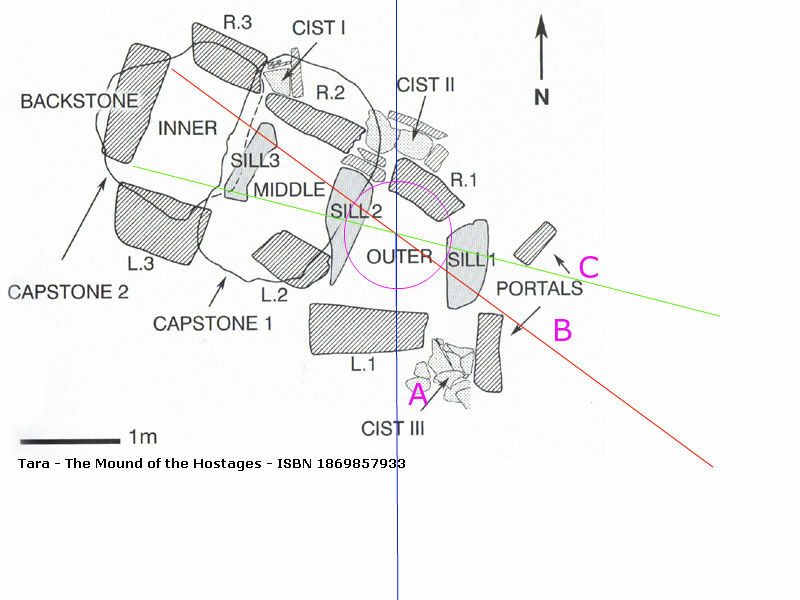 On their page for Tlachtga - Hill of Ward, they have a photo of sunrise light hitting part of the back of a small passage grave known as the Mound of Hostages. The photo was reported to be taken on Nov. 1, or the modern day of Samhain. This mound is dated archaeologically to about 5,000 years before present. That's still 3,000 years before known Celts, and 4,000 years before documentation on Samhain. 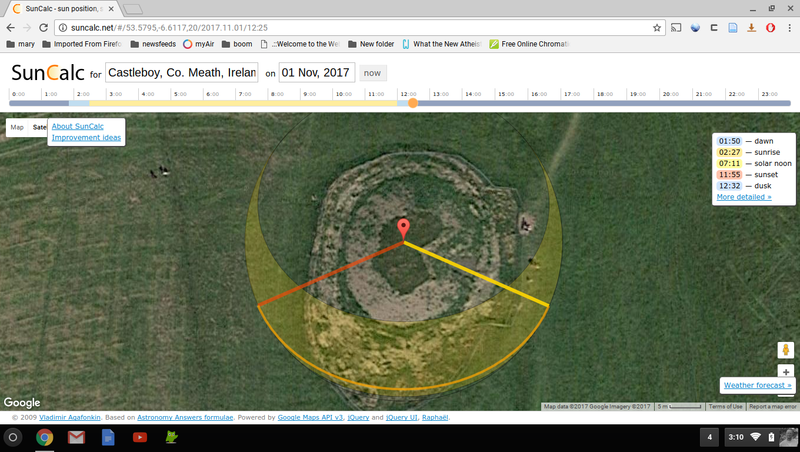 The Stone Age Mound of the Hostages is also aligned with the Samhain sun rise. The following image was photographed by Martin Dier, it shows the sunbeam illuminating the back of the chamber. The illumination is impaired by the modern gate at the entrance of the passage. Among the rest of their arguments supporting Samhain on the page, this tomb would seem to lend support for the notion that Samhain is far more ancient than Christianity. The original map is the black and white. I added the features in color. Here's the issue. I'm not able to go to Ireland for all these days to make sure that this is possible. But I want to find out whether or not the sunrise hits the back of the passage grave on any other days. This is mathematical, not an actual experiment. The Blue Line is the meridian at -6.6117,20 deg. The Red Line is the Southern most angle from which part of the back of the tomb is partially lit. Angle A to B is 54 degrees. The Green line is the Northern most angle from which part of the back of the tomb is partially lit. Angle A to C is 76 degrees. That gives us 23 degrees from North to South and then again from South to North where the sun can rise and illuminate the back of this tomb. One of the difficulties in evaluating a claim like this the general difficulty of verification. Mathematical is as close as I can get. The horizon on a smooth area of the earth is 7 miles. But there is nothing really to block the sunrise, Tara is a hill, and this is a mound on top of the hill. Google Earth even has a panoramic hilltop view. 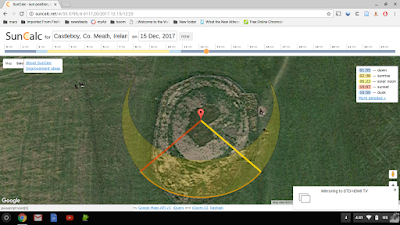 I used Sun Calc Net at the location of the grave and chose ranges of dates. This website calculates the angle of sunrise, sunset, etc, for any Gregorian date. But I'm using a physical protractor on the screen to get my angles. So you astronomy types can jump in here to suggest the correct angles. This is about 65 degrees from South. From just after October 15 the sun rises at about 76 deg from the south. At this point the light of the sunrise should start to cover the back of the tomb. The back of the tomb should continue to be at least partially covered by light from the sunrise until December 10th when the sun starts to pass 54 degrees from the south. That's about 45 or more days. And after the winter solstice the sun starts to go back north on the horizon. It crosses 54 degrees from the south some time around January 9th. From that time until it crosses about 76 degrees from the south around February 20th the sunrise should beam its new dawn somewhere on the backstone of the tomb. That should be about 40 days. You've got the links now to the tool, check the data for yourself. I know my crude angle maths are off a bit. They could be refined. But let's round down to say that the sunrise probably shows on this backstone for around 80 to 85 days during the whole year, split fairly equally during two different general seasons. Once we realize this, is there anything really special about the Gregorian date of Nov 1 (Modern Samhain) in the construction of this tomb? Not really. The Knowth website has a picture from Nov 1 with sunrise light hitting the backstone. A feat that can be done for almost 1/4th of the whole year. No there isn't anything special about Samhain in this tomb. Why should there be? If the archaeological dating is correct this tomb is 3,000 years pre-Celtic and 4,000 year pre-Samhain. Remember, what we actually know of the origins of the Celtic calendar show that it was lunar. The Celts in Ireland and the British Isles appear to have adopted the solar calendar at the same time they adopted Christianity. This was certainly the main cultural process with the Germans and the Franks adopting the Julian calendar. Certainly it was also with the Gregorian reforms for Ireland and the rest of Europe. 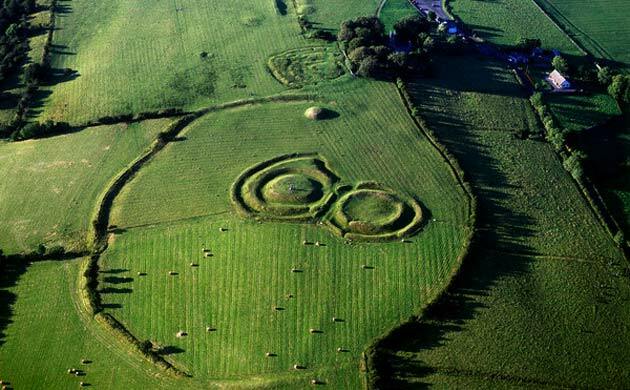 The importance of the Hill of Tara predates Celtic times, the oldest monument on the hill is a Neolithic passage tomb known as the Mound of the Hostages, built about 5000 year ago. It is circular in form, roughly fifteen metres in diameter and three metres high. It is built in the same style as the Newgrange tomb, although on a much smaller scale. The structure is dome-shaped with an inset for the entrance and a small doorway, set almost one metre into the side of the monument. The doorway is framed with undecorated standing stones. As with other passage tombs the entrance is aligned with the rising sun at certain times of the year, in this case the chamber is illuminated on the mornings around Samhain (early November) and Imbolc (early February). Inside, the passage into the Mound of the Hostages stretches for four metres in length, one metre in width, and is 1.8 metres (6 feet) high. It contains decorated stones with images of swirls and circles. 1. The page acknowledges that the tomb gets light from the rising sun for several days before and after Samhain, not just on Samhain: also getting sun in for many days around the start of February. I have summarized the ancient sources on Imbolc/Candlemas/Presentation/St. Brigit's Day here. 2. The page states: "As with other passage tombs the entrance is aligned with the rising sun at certain times of the year." All I think can really be said is that from the Summer Solstice to the Winter Solstice there is a range of about 90 degrees through which the sunrise travels on successive days, the sunset also. Roughly put, any tomb with an opening facing toward the Northeast through the Southeast will have some range of days in which the sunrise shines through the entrance down the passage, if the passage is somewhat straight. For sunsets the same is true but from the Northwest to the Southeast. If the tomb's entrance alignment falls between the Southeast and Southwest there will be some range of successive days where the noon sun will do the same. Whether sunrise, sunset, or noon, any tomb opening not facing between the Northwest and Northeast will have some day or range of days that sunlight will come into the entrance for a ways. I would suggest that perception bias based in ritual/calendar dates that have become more important culturally in recent decades influences the interpretation of the Mound of Hostages. 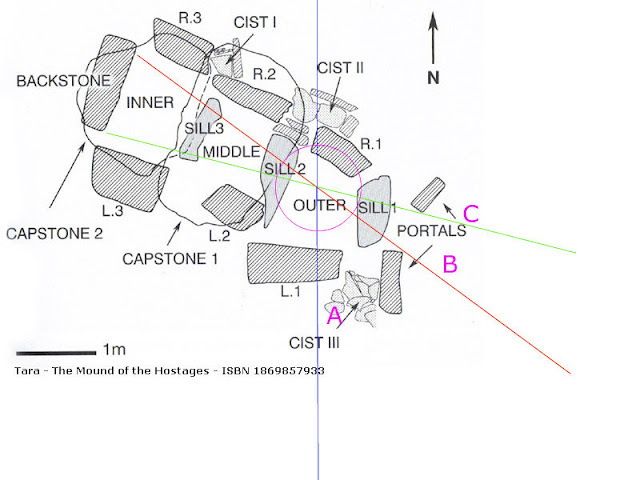 For those who are interested: a useful study on the orientation of the openings of passage tombs was published recently by Frank Prendergast, "Interpreting Megalithic Tomb Orientations and Siting Within Broader Cultural Contexts" Modern Archaeoastronomy: From Material Culture to Cosmology IOP Publishing, Journal of Physics: Conference Series, 2016.